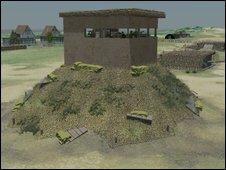 The wartime coastline of Suffolk has been recreated in a series of virtual reality animations on a website detailing the area's coastal defences. The new site has reconstructed the coastal defences built in 1940 in Walberswick and Southwold. It features videos of the emergency batteries, field artillery, trenches and pillboxes, as well as historical photographs and war diaries. It was created by a team at the University of East Anglia (UEA). The website has gone live ahead of the 70th anniversary of one of the largest construction projects in British history, the UEA said. Hundreds of miles of beaches in southern and eastern England were closed off to the public and fortified with a "coastal crust" of barbed wire, minefields and gun emplacements. The military feared tanks could land on many of Suffolk's beaches, while the wide flat expanses of heath inland were thought to be suitable for paratroop landings and armoured warfare. The UEA said many of the defences were cleared after 1945 and what remained today represented only a fraction of the original structures. Dr Robert Liddiard, of the School of History, said: "The remains of pillboxes, concrete blocks and gun emplacements often sit uncomfortably alongside beach huts, footpaths and bird watching hides. "Although they... were once considered an eyesore, World War II defences are now recognised as a significant archaeological resource and an important part of the history of the defence of Britain." The site allows users to explore the defences via a series of video "flythroughs" of an emergency coastal defence battery complete with guns, gunners, observation post and searchlight emplacements. Other videos show the hastily-built trenches and pillboxes which made up the bulk of the defences. A war diary of the 2nd/4th South Lancashire Regiment describes what it was like for the men stationed on the coast. It describes a visit by Prime Minister Winston Churchill, air raids and bombings, as well as the bodies of British and German airmen being washed up on the beaches, and the sinking of a naval vessel and the crashing of a British plane in the sea off Southwold. The UEA is keen to speak to people about their memories or experiences of the coastal defences, whether during the war or in the decades afterwards.